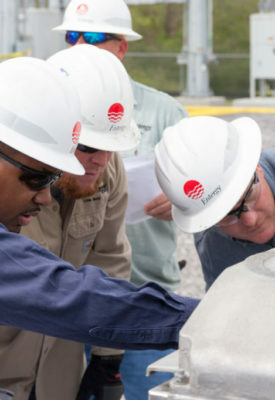 New employees of Entergy Corporation’s transmission organization are gaining valuable knowledge and experience in maintaining substations at the new Arthur “Dub” Barfield Training Substation in Clinton, Mississippi. Refresher courses for existing employees will also be offered in the new training facility. The facility is named for Entergy employee Arthur “Dub” Barfield, former Entergy director of transmission grids, who died in November 2015. Barfield spent nearly 35 years of his career at Entergy and was a champion of safe work and training practices. Was built with both legacy equipment and new standard equipment to allow students to train on many of the various types of equipment they will encounter in their daily work. Is fully operational, with the exception of no voltage. Allows students to gain troubleshooting experience. Provides a mechanic and relay lab for foundational skill development. Offers hands-on training for employees to earn switching certifications. Entergy Corporation is an integrated energy company engaged primarily in electric power production and retail distribution operations. Entergy owns and operates power plants with approximately 30,000 megawatts of electric generating capacity, including nearly 10,000 megawatts of nuclear power. Entergy delivers electricity to 2.9 million utility customers in Arkansas, Louisiana, Mississippi and Texas. Entergy has annual revenues of approximately $10.8 billion and more than 13,000 employees.